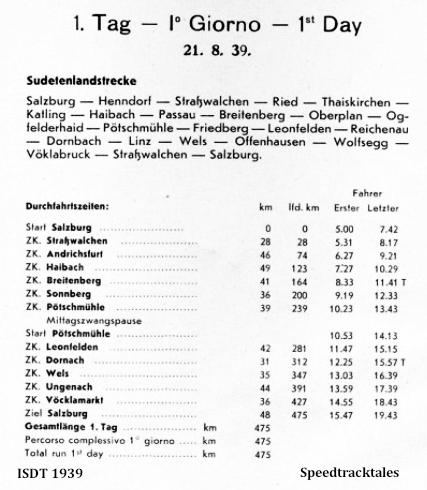 The check that makes the least sense is the one named ‘Sonnberg‘ as there is nowhere in the vicinity of the map, which is on the Czech Border, with that name. 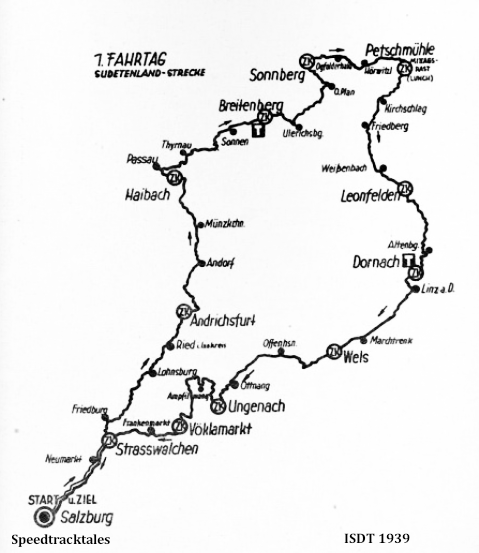 The closest place of similar name is Schönberg in Germany, but using that point quite badly distorts the route, as drawn in the programme so much I do not believe, if it were to be the correct location of the check, the map is right. (nb this area of Czechoslovakia bordering Germany has been subject to significant renaming with the rise of German nationalism in the late 19th century – wikipedia) At the time of the 1939 ISDT it had been annexed to Germany by Hitler. Luckily German reader Andreas caught this point and replied “Found the correct “Sonnberg“, it is “Slunečná“, part of Želnava, Czech Republic. 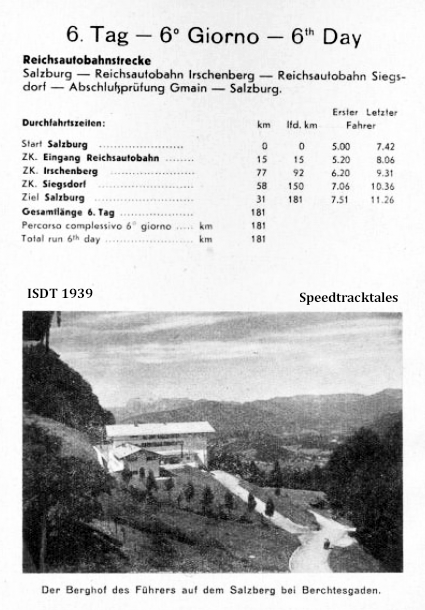 It is really not easy to track the ISDT in this region, as the names did change after the war, but also the artificial Lake Lipno had been built after the war. Additionally, the region north of the lake became a military training terrain, so some villages, as well as public roads, did disappear. 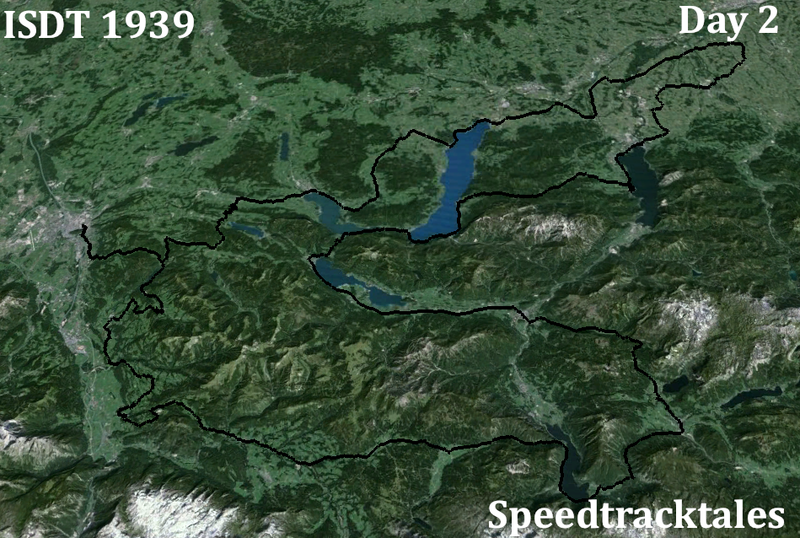 That means, that in 1939 the ISDT could take a relatively strait line from Ulrichsberg to Oberplan (Horni Planá), from there to north-west to Sonnberg (Slunečná, Želnava). This turned out to be a pretty good answer, I had been looking for other towns called Slunečná but these were far away however there appears to be a farm of that name in the right area. I can also thank the Mormons for the locating the more obscure now lost places through their impressive obsession with recording family history records. This includes recording parish registers and at this website places that have been wiped off the face of the planet can be found from a Latter Say Saints’ Website place name search. 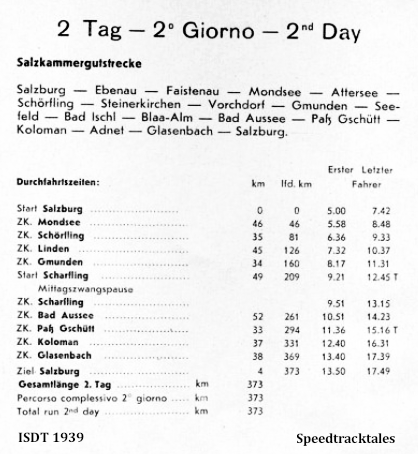 Not with usual German efficiency, the official route map seems to indicate the checkpoint will be at Rain however the table below (Supported by magazine articles of the time) clearly states it was at Sankt Koloman. 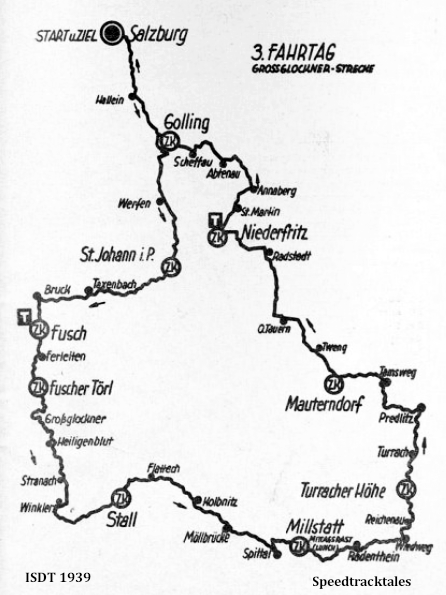 Also, in order for the course to take in Rain and Strub between the Paß Gschütt and Kuchel the route would have had to made a large detour of the Berchtesgarden National Park which would be an obvious long additional circuit that is missing on the map although the places are named but nowhere near their proper location. 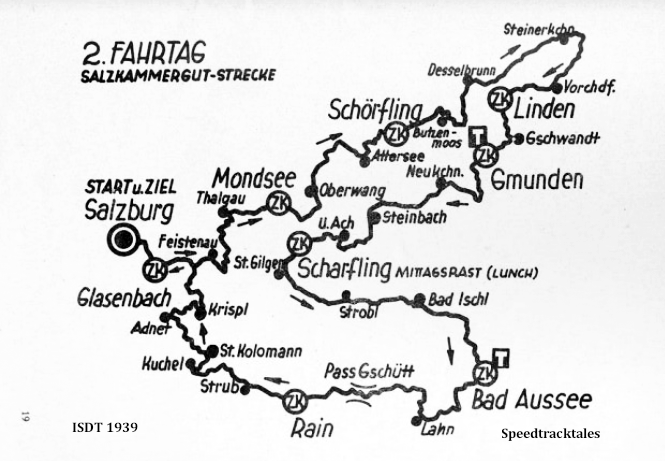 Luckily again Andreas came to the rescue with place names more appropriate to the map ‘Mühlrain‘ and ‘Strubau‘ and also helpfully provided a link to a German online historic map archive. 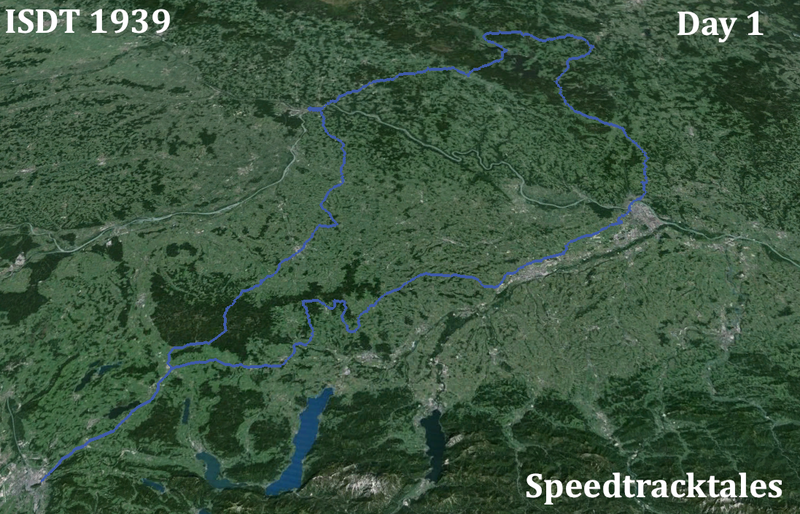 This should help identify which of the present roads may not have existed in 1939 and have been subsequent additions to the national road networks of Austria and Germany. I am confident most of the course is correctly mapped the only two significant areas of doubt at the section after the check at Linden on to Gschwandt. Also the Paß Gschütt to Strub and Kuchel. It would appear from Google Maps a route to do this would require two way traffic, something they would not be able to do. 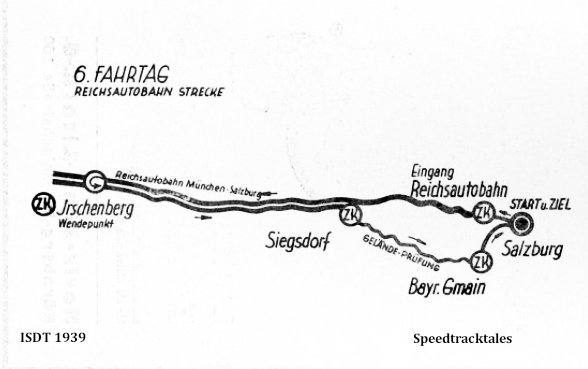 However the text in ‘das Motorrad’ mentions a difficult technical descent into Kuchel before reaching the check at Sankt Koloman so it is possible the in route is not along defined tracks but followed something more temporary in nature. Sadly nobody is left who can tell us if this was the case and where it was! 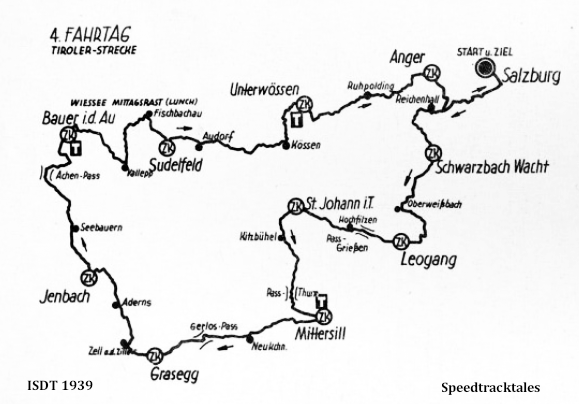 This was the day the event crossed the Großglockber Pass, A road that was built by private finance starting in 1924 and was opened in 1935 – Wikipedia much to the joy of Europe’s Petrolheads both then and today. The first day the route description and place names seemed to match 100%, am pretty sure this is generally the right route. 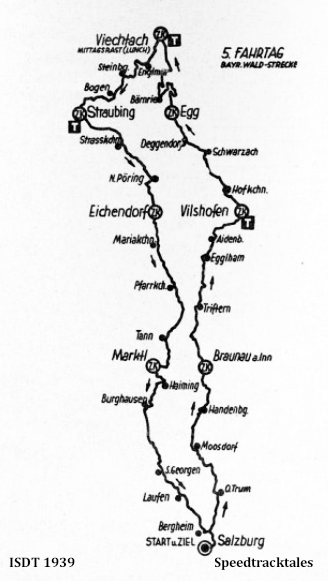 Places names that appear no longer recognised include Seebauern – which exists but is in the wholly wrong place and would appear to be close to Achenkirch on the approach to the Achen Pass. Also Kallepp would appear to really be in the middle of no where not even served by roads and possibly is a locality in a mountainous area. 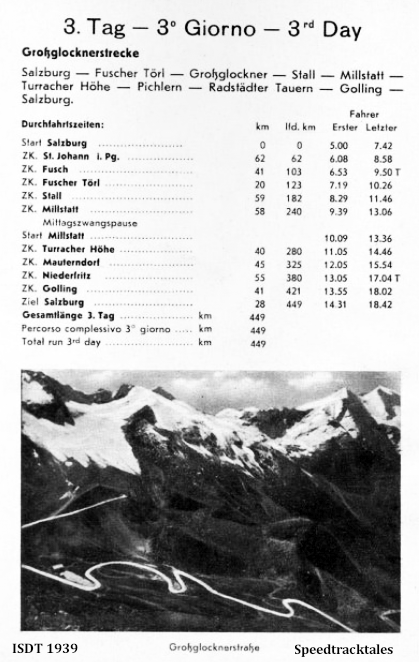 Überwössen is listed in the checkpoint list but the map places the check at Unterwössen. From a British point of interest this was the last day the British Riders competed. Overnight they would be given information from the British Government that required their immediate withdrawl from the event and promt return home before the event ended. 31 Brits finished the 4th Day. Drawing the route was not an easy choice. 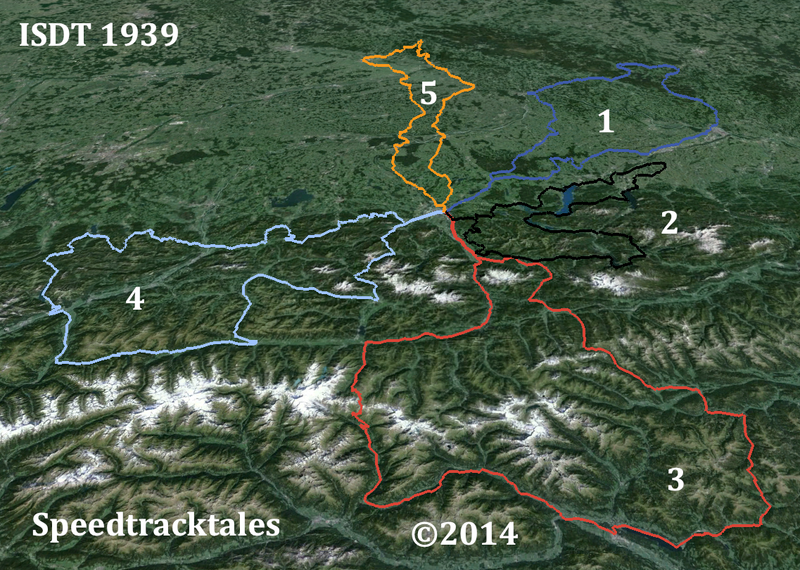 This was a day in the South Tirol with deep valleys lodged between impassable mountains. 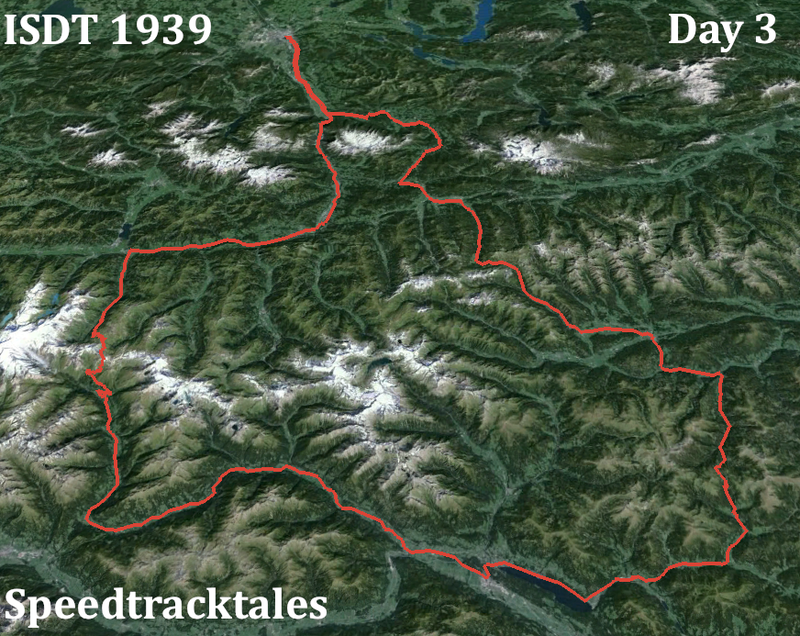 Not knowing the area has been a hinderance, when compared to working out the Welsh Routes, and trying to recreate a route of 1939 with only modern maps with many new roads imposed on the area to improve access for ski resorts and take advantage of EU funding has meant a lot of new roads may mislead the uncovering of the original routes. 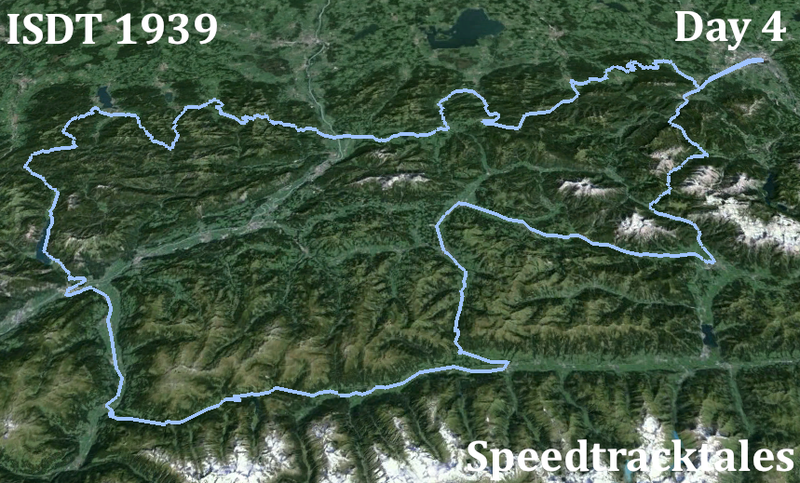 And the original route may of course lay obliterated under a modern primary route. 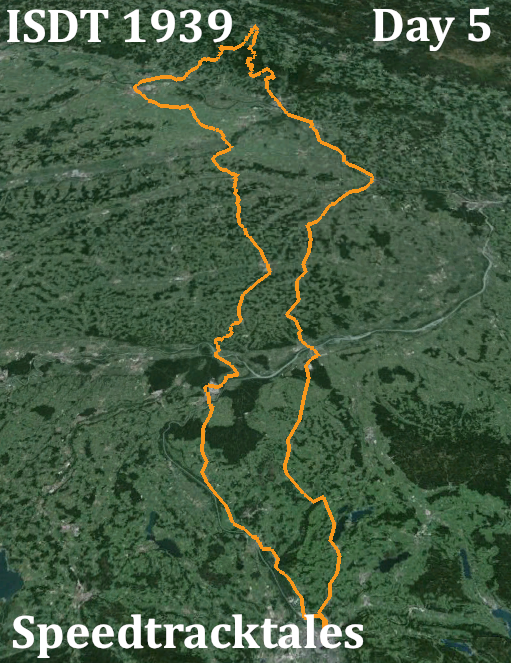 Todays route goes with a large CAVEAT….. My confidence for some parts of the route to be either on the old route or even legal to try to use today is doubtful and if anyone can comment on the assumed route between Ruhpolding and Anger I will make any changes suggested to correct. work in progress? 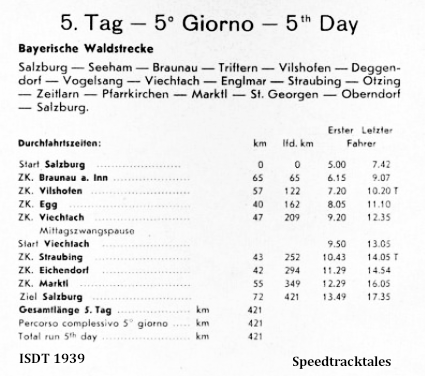 well maybe the sixth day was virtually a rip up and down Herr Hitler’s new Munich – Salzburg Autobahn you could almost find it on any in Car GPS device. 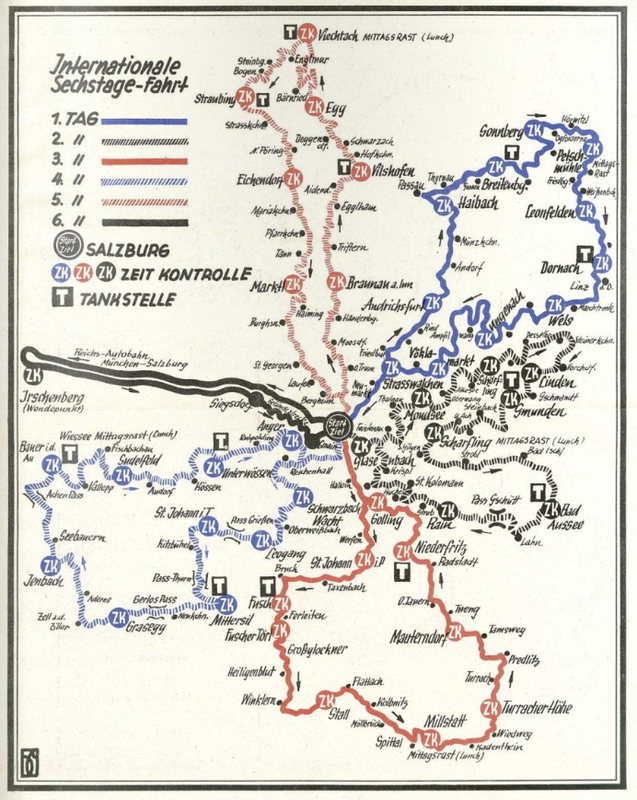 In what appears to be an exercise independent of our own work I have found digital maps of each days route of the ISDT in 1939 on the mopedmap site created by Pablo99 which I have provided links to here. 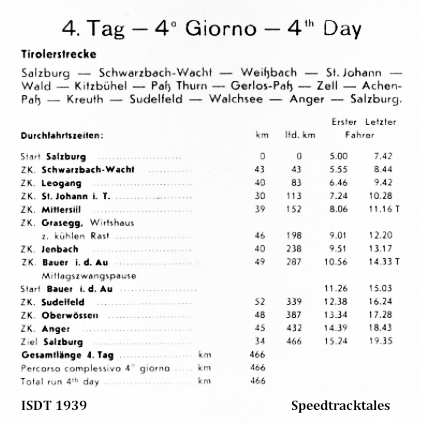 If Pablo finds this post and would like anything adding to this post as I dont know any thing about him or his interest in the ISDT of 1939 please comment on this page.